It appears Bobby Bradley is emerging from his funk. Cleveland's No. 3 prospect launched a pair of two-run homers and a double to drive in five runs as Double-A Akron blanked Bowie, 15-0, at Prince George's Stadium. Bradley struggled out of the gate this season, recording 10 hits in his first 79 at-bats (.127) with a pair of long balls. The 21-year-old had a breakout performance Tuesday against Binghamton, delivering a homer, a triple and three RBIs in his second multi-hit game of the season. Despite going 0-for-4 on Wednesday, he's boosted his average 47 points over the past three games. "I'm feeling good and just starting to kind of find it again," Bradley said. "I've been working a lot on being patient. Just not trying to do too much and relax at the plate and focus on each pitch. I've been working with [RubberDucks hitting coach Kevin Howard] on just trying to be as fluid as possible and not be too jerky with my upper body. I want to leave that out of it and just use my hips when I swing." After striking out swinging to end the first inning, the 2014 third-round pick laced an RBI double to center field off Orioles No. 4 prospect Hunter Harvey in the third. In the fifth, Bradley caught hold of a 1-0 fastball and blasted it over the wall in left-center. He came up again in the next frame and turned around a 2-2 pitch to right-center for his second roundtripper. The Mississippi native gave the ball a ride deep into left-center in the seventh against southpaw Reid Love, but it was run down just shy of the warning track by Baysox outfielder Mike Yastrzemski. "When I hit that ball, I didn't think I got enough of it, but then it started to carry really well and I thought, 'Oh this has a chance," he said of his final at-bat. "But I'm not trying to hit home runs when I step to the plate. I'm just trying to keep my approach of using the middle of the field, and in this case, have a good at-bat against a tough lefty." Bradley's ability to hit for power has been his calling card throughout his professional career. He eclipsed the 20-homer mark each of the past three seasons, going deep 79 times over that span. "A lot of these teams know me now, so they're showing me different things," said Bradley, who batted .251/.331/.465 over 131 games last season in the Eastern League. "So my main focus right now is to just be patient, wait for my pitch and not try to do too much." Joe Sever and Andrew Calica finished with three hits and a pair of RBIs apiece while No. 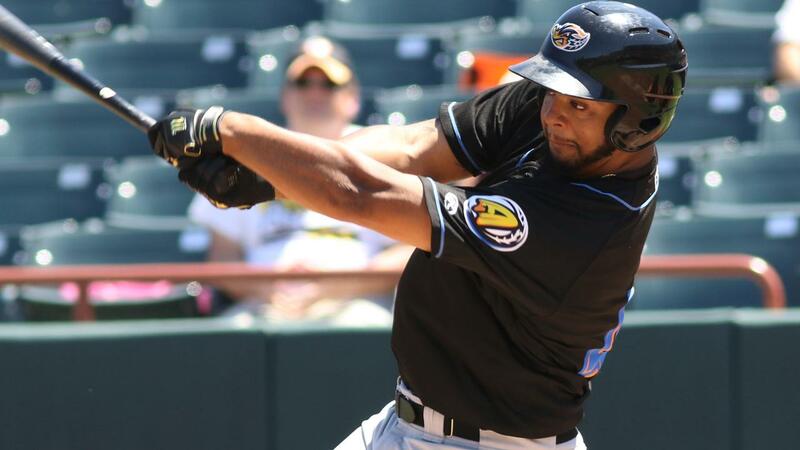 5 prospect Willi Castro and Sicnarf Loopstok each drove in two for Akron. Jake Paulson (1-0) scattered seven hits and a walk while fanning three over six frames. The right-hander turned in a solid bounceback performance after giving up seven runs on 10 hits over 4 2/3 innings last Saturday. Harvey (0-1) only lasted four innings for Bowie. The righty, who threw 42 of his 69 pitches for strikes, surrendered four runs on six hits and two walks while striking out two.